Kurt Cobain spelled his name sevreal different ways for no apparent reason. The odd spelling Kurdt came from when Nirvana recorded “Mexican Seafood” for the “Teriyaki Asthma” compilation. When it came time to make the album, they realized that they didn’t know how to spell Kurt’s name so they got a hold of someone who “thought they knew”. Here’s the Kurdt Kobain credit from the “Teriyaki Asthma” album. 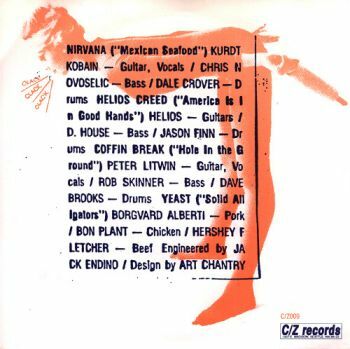 The Kurdt Kobain spelling was also for the album credit on Nirvana’s “Bleach“. He later used the misspelling to give himself some anonymity. The ‘monkey photo’ credit on Nevermind is also credited to Kurdt Kobain. Other misspellings can be found in autographs, etc., like first names Curt, Curtis, and last names Cohbain, and Covain. Cobain also later used the aliases Mr. Poupon and Simon Ritchie (the real name of Sid Vicious) when checking into hotels, to avoid media and fans.